At the heart of the Balearic capital, Palma de Mallorca, Paseo del Borne 26, is the Multiopticas Sunglasses shop, belonging to the leading Spanish chain in optical services, with the latest trends, the widest range of products, and expert advice, offering visual and hearing solutions. In this Multiopticas establishment, the Galician company MALASA was entrusted with the design and creation of the solid surface from PORCELANOSA Group, KRION, in its 0101 White Nature colour. The Nature Series, to which the 0101 White Nature colour selected for the establishment belongs, with the ECOCYCLE® seal, has the main characteristic of using a high percentage of recycled material, with a maximum of 40% and minimum of 20% in the series. The Nature Series has colours with a natural appearance reminiscent of nature in its purest state, combined with ecological design and sustainable technology. 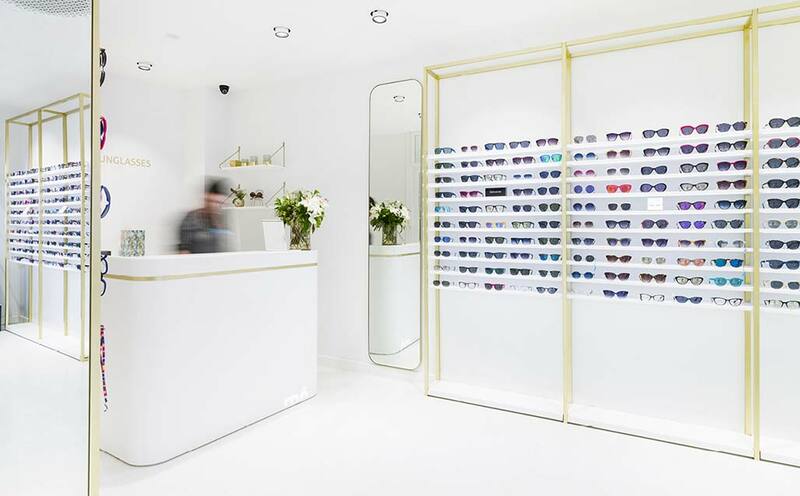 We can find KRION in Multiopticas Sunglasses transformed into a reception desk with the backlit “mó” logo, shelving, and the display of the shop window which pedestrians in Paseo del Borne can observe.